I have just experienced some of the most remarkable few days in the history of Ellel Ministries! We have been celebrating the twenty fifth anniversary of the work and giving thanks for everything God has done, both at Ellel Grange, where the work started, and around the world. In addition to our own sharing in the meetings we have had brilliant teaching from Jim Graham and Stuart McAlpine as well. But yesterday’s birthday celebrations, in a hired marquee on Ellel Grange lawns, were made so very special for a different reason! Here’s the story. 25 years ago the completion of the purchase of Ellel Grange had been timed by the lawyers to take place at 4.00pm on the 31st October 1986. A small group of us were waiting to enter the building and take possession of the property for the Lord. When we did so, however, the vendors reported that their lawyer was saying that the money wasn’t all there and there was a £100 shortfall. So we were asked to leave the property again! By the time this apparent discrepancy had been resolved, and completion had taken place, it was getting on for half past four. But that was twenty five years ago . . . ! The day began with one of our long-term advisers to the ministry, Bishop Graham Dow, launching the day in prayer. After the worship Bishop Graham then shared something of his own experience of healing and deliverance. And within this he mentioned that from Genesis to Revelation God had used the natural elements to speak to mankind. It was to prove a prophetic word for the day. Following Bishop Graham’s words, the Lord prompted me to repeat several times in my own teaching that our God is a God who speaks. Then, in the afternoon, when Stuart McAlpine was teaching on the joy of the Lord, quite suddenly it began to rain heavily. And then it happened! Those who could see out of the plastic windows of the marquee were no longer listening to Stuart’s teaching — they were pointing to something going on outside. They got up to look closer and Stuart himself got down from the platform to see what it was all about! What we all saw was totally spectacular. A huge gap had opened up in the clouds and the late afternoon sun had come streaming through. Right in front of our eyes, over Ellel Grange, was the most brilliant rainbow most of us had ever seen — it was a complete rainbow — a double rainbow — a sensationally bright rainbow. The complete arc was too wide for anyone to get into one picture on their camera. It was totally stunning. 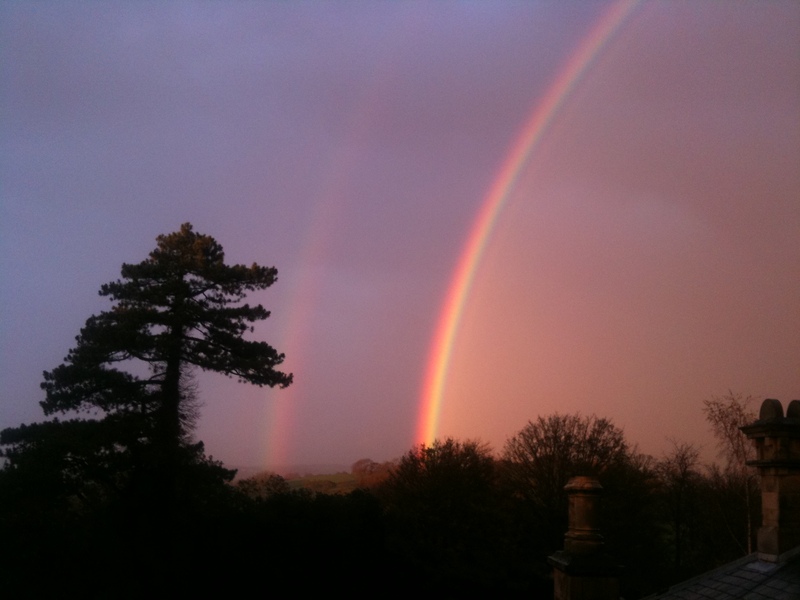 But then I was reminded of the fact that the time at which the rainbow had appeared, was at exactly the same time as, twenty-five years ago, we had finally entered Ellel Grange as owners of the property, and given it into the hands of the Lord. Everyone knew that God was speaking His covenant promises to the ministry. He had set His bow in the clouds once more. The God who speaks had spoken. Over 3000 years ago God spoke to Noah and said, “I have set my rainbow in the clouds . . . and whenever I bring clouds over the earth and the rainbow appears in the clouds, I will remember my covenant between me and you . . .” Genesis 9:13-14. We were experiencing one of those ‘whenevers’! We were so encouraged to realise that God had spoken into our celebrations with a statement of his own, that he is a covenant-keeping God – and that we can totally trust our future into His hands. I am in healthy spiritual shock as I am typing these words, just wondering what lies ahead for the ministry – but knowing that whatever does lie ahead, we know that God has given us His promise for the season to come, and it was written in the sky!